If you've followed the blog for a while, you'll know I love improvising and have done so with knitting and crochet (it's how most of my early designs started) and with up-cycling small things for the children. After seeing lots of my favourite 'knitters' sewing garments, I really wanted to join in with something quick and easy - the sewing equivalent of garter stitch. It came in the form of a Creativebug class - "Trace a T-shirt, Create a Wardrobe". 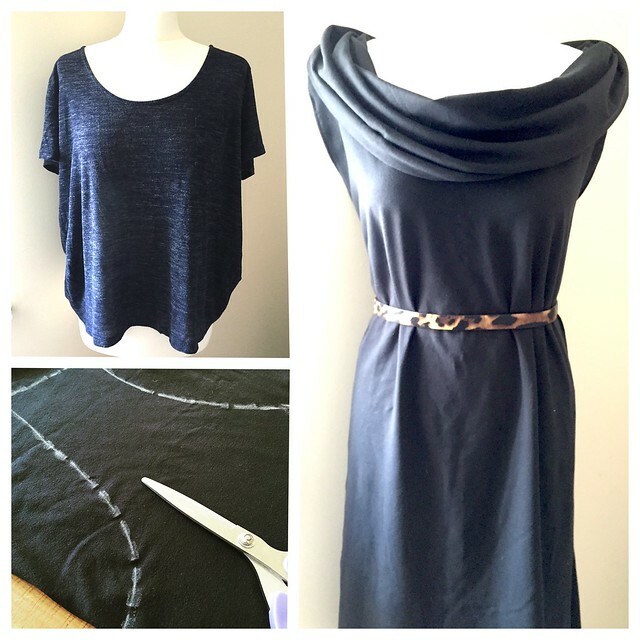 In less than an hour, I learned how to use an existing t-shirt (which fits well) to create a template for jersey tops or dresses of any length with different amounts of drape and flare. My chosen t-shirt is one that I still wear quite a lot so I didn't deconstruct it, instead I traced around the different parts to produce my paper template which was laid onto my fabric and the shape chalked out. With the length and width adjusted to my requirements it was pretty straightforward. I'm not a great sewist but the fabric was very forgiving and, as it doesn't fray, there is no need to hem it.... however I grew up with *my* mother and couldn't leave raw edges so I added some hems and then decided to add a cowl neck - which complicated things far more than was strictly necessary. It's not washed or ironed yet (and is still covered in chalk) but I couldn't wait to show you. Also, my 'model' is much slimmer than me, so I've used the fabric shop trick of gathering everything in at the back to give you the general impression. It's *far* from perfect, but for my first attempt I'm pretty pleased with it. It would have been easier with a rotary cutter and cutting mat, and may not have needed hemming - my scissor-cut edges are not all that neat. So those have been added to my wish-list. 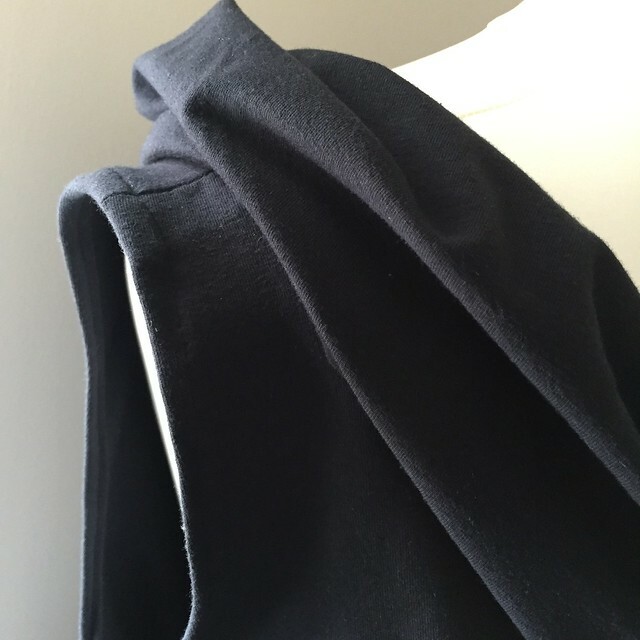 After watching the many useful tips for handling jersey on the Creativebug class, this medium weight fabric was easy to work with and feels very comfortable to wear. It's thick enough that I don't have to wear another layer underneath, but if I do it won't be too bulky. The jersey came from myfabrics.co.uk where I also got the same fabric in a gorgeous cobalt blue ready for my next project. They are priced at £9.95/m (this project took 1.5m) but if you place a fabric order over £35 using the code "CWTCH0615" you'll get a £10 discount - the code is valid until 20th July 2015. The class by 'Improv Sewing' is available as part of the all-inclusive Creativebug subscription - you can start with a free trial now if you don't use it already. (I started that way and liked it so much I subscribed and became an affiliate - you can see my review here.) A book is also available from the same instructors on Amazon.com and Amazon.co.uk - it includes 101 fast free-form projects - another thing that's on my list! the dress looks fab! i love when people (especially knitters) discover the joy of sewing clothes too!